Every copywriter knows what it’s like to have their work ripped to shreds by a client like a wolf on an injured bison. And it’s only natural to feel a bit defensive, especially when it’s your creativity – your bread and butter – that’s been called into question. I’ve been in this game for over a decade and I still get secretly miffed when people mark up a myriad of changes, when I’m told my stuff’s completely off-brief, or that it’s “banal” (only last week). But I try not to let it show. Although it takes a bit of practice. So whether it’s your concept idea, your first draft, your fifth draft or your final version that has been pooh-poohed, here’s how you can transform everything that’s bad about rejection into a force for good. The world would be a pretty weird place if everybody liked the same things. Even stranger if everybody got things right at the first attempt. So you need to accept that not everything you write is going to instantly strike a chord with every client. And as long as they’re not calling you a fat waste of space, don’t see it as a personal attack. It’s not a fact that your copy is bad, it’s just their opinion. It’s their opinion on whether you’ve solved the problem, rather than if you’re capable of solving it. So when the killer slogan that you spent two hours perfecting gets slated, it’s probably still a good idea, but just not to the client’s taste. Wherever possible, don’t respond to any negative feedback immediately. You should always reply to a client with your head, even though it’s your heart that will have received the biggest body-blow. So you should take at least a few minutes to consider a professional response, especially if your critique has been anything but. This is easy to do if you’re working remotely, but if you’ve taken a face-to-face pasting, simply remain calm and try to look as enthusiastic as possible. Thank them for their feedback, ask what improvements are needed and always remember that editing is just a part of the process. While your work is being judged, remember that your client will probably be judged on what you’ve written too. So it’s likely they’ll want to tweak a few things and ensure it’s word perfect (even when 90% of changes detract from what you were trying to achieve). And many times, clients make subjective changes for the sake of it, simply to put their stamp on something. If you’re writing for a business owner whose livelihood depends on the success of what you’re working on, it’s even more important to see things from their perspective. And when they think a word, sentence or idea doesn’t quite fit, they’re being picky because it directly affects them financially. So show a little empathy even when you want to scream. Okay, they didn’t like what you’ve written this time. So this is your golden opportunity to turn around a jaw-dropping second draft in double quick time. Being able to tailor your style, tone and vocabulary at speed shows what a talented copywriter you really are. Asking for their in-depth feedback on a rejected piece also shows you’re keen to get it right for them. So when they say “it’s just not what we were after”, ask them specifics about what’s not working, and where, and don’t begin writing until you’re absolutely clear what needs to change. I’m not getting all philosophical on you, but I’m a firm believer in whatever happens to you in life – good or bad – teaches you a lesson. This is amplified when you work. When my writing is criticised, I don’t dwell or mope (for too long), but see it as a challenge to make it better. And to learn from whatever mistakes I may have made so I make them less frequently in future. Sometimes you’ve made no mistakes at all; the client is just awkward. But even so, I always question myself: Did I challenge the brief enough? Should I have asked more questions? Could I have worded this better? Should I have done more research? And if the answer to any of them is yes, I know what I need to do to improve the way I work. You should never throw anything away. Even if a client hates what you’ve done, seething with rage, spittle and bile as they tear your copy to pieces, it might still come in useful another day, on another job, for another brand. Not word-for-word, but certainly the concept. In addition to the final document I send to a client, I keep a “development” file, showing the slogans and sentences that poured out of my head as I thought them. Like when you get marks for showing your working out in maths, seeing your ideas go from blank page to polished piece of work could come in handy on future jobs, where something great you’ve already written could be recycled and put to better use. And if you’re proud of something you’ve done that eventually gets shelved, there’s no reason it can’t still go in your portfolio. 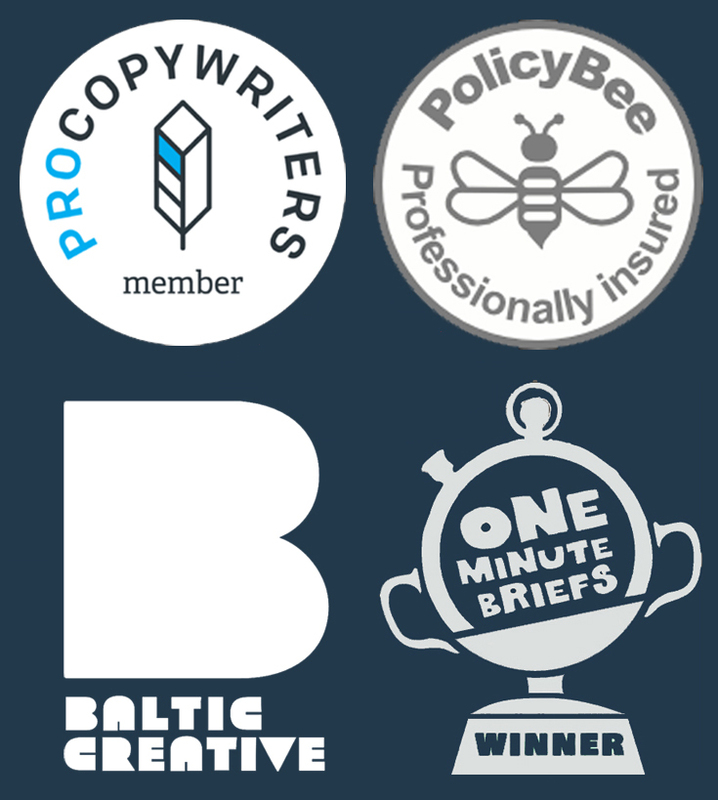 On some press adverts I wrote a while ago, the client went with my safe option, whereas I preferred the other two. But I’ve still included all three concepts in my portfolio. So that’s all there is to it, for me anyway. 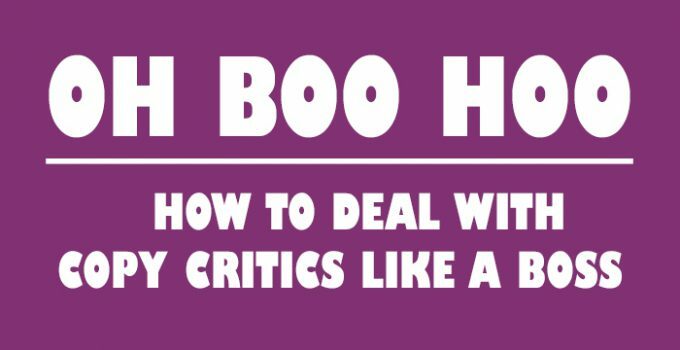 Do you have any other tips for dealing with criticism? How about praise? Do you find it easy or difficult to take compliments on a job well done? Get involved and leave a comment. Trying not to take it personally, but it’s bloody hard. My fragile ego is struggling to cope, but your article has helped! Cheers Dan, glad it helped. You really do have to detach your feelings from the process. It’s hard to do at first, and you’ll always get clients like this. The skill is dealing with them professionally and showing your ability to adapt the copy to what they want. I’ve done a few pieces of copy and had good feedback, but this morning I received my first ‘I’m going to need a complete rewrite’. Bit of a kick in the goolies, but this article has made me stop and take a breath.